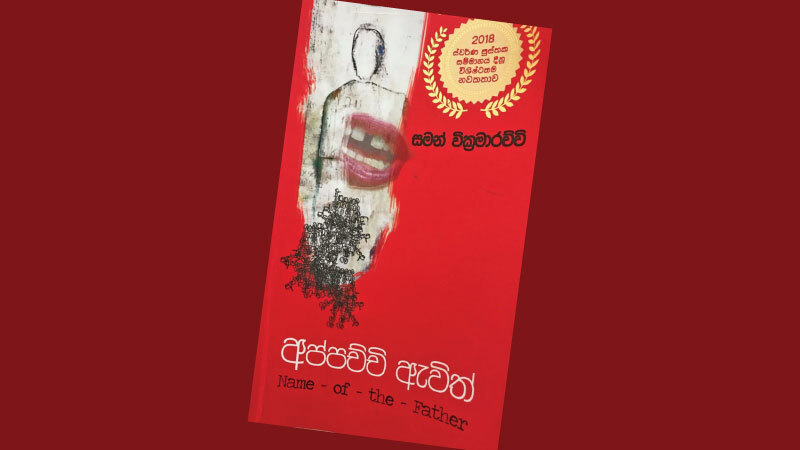 The recipient of the prestigious Swarna Pusthaka Award for the best novel in 2018, Saman Wickramaarachchi’s “Appachchi Avith” (titled “Name of the Father” in English) has been commended as an unqualified success in the Sinhala social and print media which had prompted me to pen my comments on the book. To me as a whole, the novel is fundamentally flawed, too contrived and unconvincing with little literary merit to speak of or to savour. In keeping with what appears to be the contemporary norm, written in vernacular Sinhala, I found the book to be easy light reading and generally jejune (partly due to the quality of the language and partly due to the lack of sincerity of the novelist and his superficial level of observation). As soon as finished reading the book, I was struck by this involuntary thought: “If this work can win a major award as the best novel and also receive high ‘critical acclaim’ from the literary fraternity, the contemporary Sinhala literature and criticism is in dire straits and in a serious crisis”. Whether this book can qualify as the full-length novel is debatable. This should qualify more like a novella or a long short story. If printed on the standard A5 size paper with standard margins, Appachchi Avith is likely to be slim bookof115-120 pages. On a smaller 4.75-inch x 7 inch paper, with generous margins and white spaces and a larger font, this runs to 223 pages. I would not bicker with the length so much if the content has substance and literary merit. I can only assume that the judging panel was not unfair by other novelists when picking Appachchi Avith as the best novel in spite of its short length, obvious faults and the pretentious shallow nature. Having not read the other novels shortlisted I cannot comment on these. Admittedly the writer has made a conscious attempt to emulate the genre of the modern or the postmodern novel and adopt a new narrative technique for his discourse. Hence it may be relevant at the outset to briefly look at some features or aspects of the modern or the postmodern novel as a means to provide a framework to critique. Modernist literature is characterised by a conscious effort to break away from the traditional way of writing which includes a clear beginning, middle and an end (or an introduction, the conflict and the resolution). Historically the third-person omniscient perspective has been the most commonly used in narrative writing: it is seen in countless classics by those 19th-century masters including the works of Dickens, Turgenev, Tolstoy and George Eliot to mention a few. An omniscient narrator will present an all-encompassing point of view, seeing and knowing everything that happens within the world of his story from his inner eye including what each of the characters is thinking and feeling and how should be acting in a situation. The omniscient writer ideally is a great psychologist like a Tolstoy, a Dostoevsky or a Flaubert with an unfailing insight to his characters, so that the characters can be presented to us with unerring vividness as if they are real-life characters. The ever-reliable omniscient narrator will leave no stone unturned to ensure that the truthfulness or the objective of the plot or the realization of his themes is not compromised. Pioneers of the modern novel can be traced to the likes of Virginia Woolf (Mrs Dolloway-1925 To the Lighthouse -1927), James Joyce (Ulysses -1922) and Franz Kafka with some important precursors being Dostoevsky and Conrad. The postmodern novel which starts in around the early 1950s after the outbreak of the World War II is virtually an extension of the modern novel. The modern or the postmodern novelist has been looking for more flexibility on his role. Critics generally agree that the modern and the postmodern novel can be characterized by a reliance on narrative techniques involving fragmentation, paradox, an unreliable narrator; rejection of the rigid boundaries between high and low art, lack of clarity in the way characters behave, use of irony satire and metaphor. Stream of Consciousness is a new narrative voice used by some modern novelists- notable early exponents being Joyce, Virginia Woolf and Marcel Proust. The stream of consciousness- loosely comparable to an internal monologue can be described as a literary style in which a character's thoughts, feelings, and reactions are depicted in a continuous flow uninterrupted by narrative description or conventional dialogue. Appachchi Avith is a clear attempt to break away from the third person omniscient narration-the novelist has leant to a large extent on the Stream of Consciousness as a literary style or a narrative technique. The novel is underpinned by two interdependent themes. According to the author, the primary or the central theme is derived from a concept the French psychologist Jacques Lacan (1901-1981) presented (in mid1950’s) to cover the role of Father in the Symbolic order which he termed “The Name of the Father” from which the English title of the book is derived. This concept (though downplayed by Lacan himself later) describes the influence of cultural and social law within the family associated with the actual figure of the Father. Taking “Name of the Father” as a signifier Lacan postulated Father as a symbolic function to which all group or community members are subject to, a community or a family cannot function without the influence of the Father who can be the Real, Symbolic or an Imaginary Father. The other theme of the novel is a study of a paranoid/schizophrenic/ psychotic government official and his interaction with his family and the workplace. The storyline can be summarised as follows: Nissanka Senadheera is a senior executive officer in public service and is married to Sumali whom he had met whilst studying in the same university. They have a 10-year-old daughter, Sumudu. Sumali works in a bank. Nissanka’s manager is Nihal Samaradivakara who is about to retire from service which will open the door for Nissanka, his next promotion as the director. With a humble beginning, Nissanka has been raised in a dysfunctional family headed by a drunkard father with loose morals. Though the medical doctors (surprisingly) fail in clinical diagnosis and declare him as a “normal” person, Nissanka suffers from paranoia/schizophrenia/psychosis but is blissfully ignorant of his condition. Nissanka imagines that his “infirm ageing” father had come back to live in his household again. He is obsessed with “communicating” secretly with the father endlessly. His father, in fact, had died sometime back and all these encounters are hallucinations in his schizophrenic mind. In all these imaginary dialogues/ monologues, with his patronizing ways, it is the Father who has the first and the last say in keeping with Lacan’s concept. He is virtually “possessed” by his father. Unable to cope with the husband’s highly irrational behaviour, Sumali leaves him, taking away the daughter with her. Highlighted by irregular attendance, negligence of duties with very serious lapses, his behaviour in office is equally absurd. The culmination of this story is that Nissanka kills his wife and daughter by slitting their throat after preplanning murder.